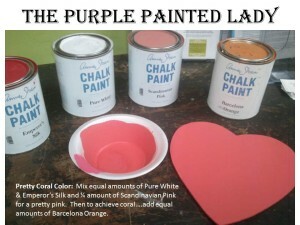 Have you wondered what custom color 2 or 3 Chalk Paint® colors mixed together would create? 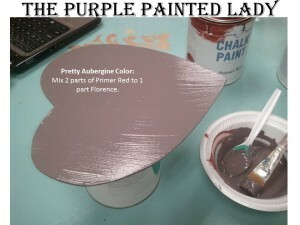 If yes…post your requests on my Purple Painted Lady Facebook page (and if you have a preference on the ratio, note that) …….and we will do the mixing and then post the results for you within a week or so. 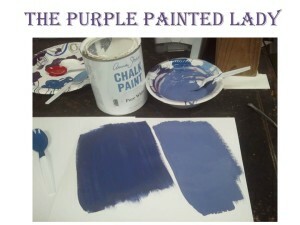 Below is the progression of the mixing we did for a request for a custom Periwinkle Chalk Paint® color. 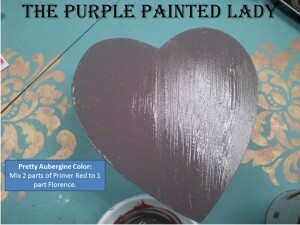 First, I started with equal amounts of Emperor’s Silk Chalk Paint® and Napoleonic Blue Chalk Paint® on the far left. 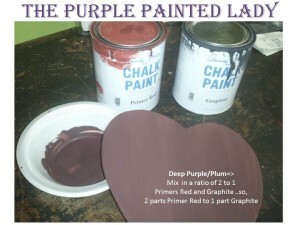 The first paint swatch shown on the far LEFT reminded me of the color of a Black Cherry since it was a red/purple. 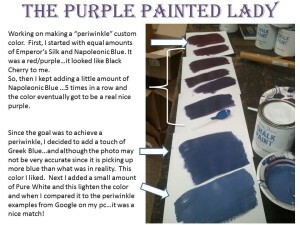 So, then I kept adding a little amount of Napoleonic Blue …….5 times in a row I did that and the color eventually got to be a real nice purple. 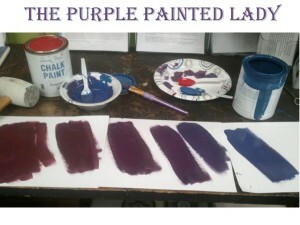 I like the shade of purple after the 4th addition of Napoleonic Blue the best! 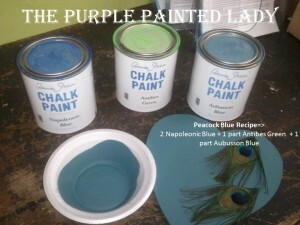 Eventually- after adding quite a bit of Napoleonic Blue to Emperor’s Silk- I added a touch of Greek Blue Chalk Paint® and the image below is what was created. 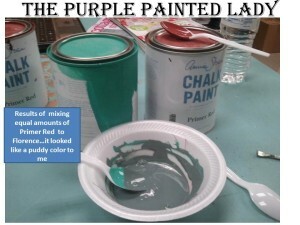 When I matched this paint swatch to my Google images of periwinkle custom Chalk Paint®– I was happy with the result! 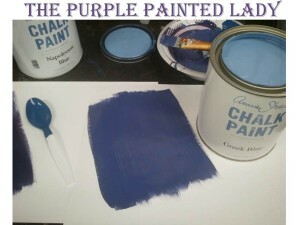 On the left below is the paint swatch of “periwinkle” we created by adding quite a bit of Napoleonic Blue to Emperor’s Silk- and then a touch of Greek Blue. 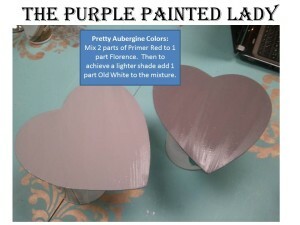 On the right is the paint swatch after we added a small amount of pure white.